A new album called Night Crossing: An evolutionary journey and a movie in your mind. 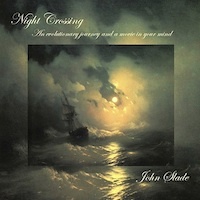 Mellow but taut, interior but epic, Night Crossing takes the listener on a voyage from sleepy twilight into radiant, conscious dawn. This page requires the free Flash player for proper viewing and music previews. Download it here from Adobe. If you are on a mobile device that does not support Flash, visit the CDBaby website to preview/buy the album. And, we were both absolutely blown away!! The songs, the arrangements, and your voice are profoundly wonderful. I am sooo proud and in awe of you! My personal favorites are Captain Quinn, Erie and Intimacy, but all are truly excellent…..and varied and different…..woven together like a tapestry of colors and hues. Laurie and I both think your new arrangement of Intimacy brought that song to life like never before and showcased the lyrics even more. Laurie has always loved that song anyway. All of your arrangements are inspired…..wow. They are thrilling to listen to and enhance each song in a symphonic fashion. And, your voice has nuances we’ve never gotten to hear before. John you are Really, Really Good! I hope the rest of the world gets the chance to know it too. Nice job, pops! It was especially cool hearing the bald eagle song (cut 5). I had completely forgotten about that one. Great melody… Tragic yet hopeful.